Our Children in Need 'Pudsey' Day raised £560! A massive thank you to our amazing community for all their donations. 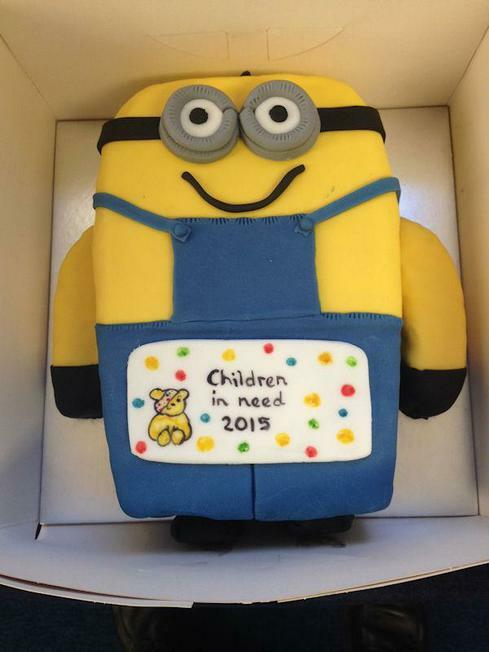 It all started this year when we received the donation of this amazing Minion cake for our raffle! Thanks very much to the extremely talented Mrs Ryde. Our School Council, led by Mrs Day, spent many hours baking and decorating delicious - and beautifully-iced - fairy cakes to sell at the event. The school kitchen survived. Miss Barton lends a helping hand. That's a whole lot of cake! One of our young bakers ready for action! Giving it a good mix! Our children were fantastic! They came up with ideas for stalls and games; and then at home, lots of them made biscuits and cakes of their own to sell. They organised, priced and ran their fund-raisers completely by themselves. We must add thanks here to their parents and carers for letting them loose in their kitchens! School councillors collecting the cake! Our children and staff enjoying the many stalls. Mrs Gallen shows our younger children around. The lads run their cake raffle. Onesies are the order of the day. Is it a bird? Is it a plane? No!! Super-Pudsey!! A very busy - and very fun - day! The raffle was held in our Friday Praise Assembly, and lots of children won prizes donated by our community - including the GBC (Great Big Cake), lovely knitted characters (thanks again to Mrs Ryde and her friend, Hazel, for their hard work), toys, games and treats.